Not everyone can afford to buy the latest rulebook, the next expansion, or the newest miniatures. Not everyone wants to do that either. 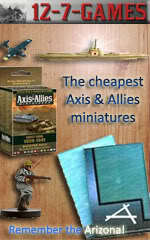 It is not only possible but exciting to wargame on the cheap. In this episode Jonathan shares some great ways that you can wargame on the cheap. Jonathan turns 31 on Dec 22. Wish him a HAPPY BIRTHDAY! Wargaming Recon is on break returning with a new episode on January 7, 2013.